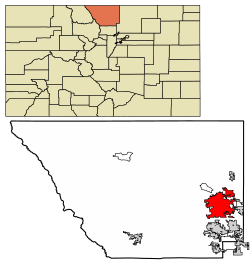 Fort Collins is the Home Rule Municipality that is the county seat  and the most populous municipality of Larimer County, Colorado, United States. 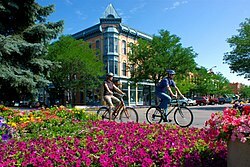 Situated on the Cache La Poudre River along the Colorado Front Range, Fort Collins is located 56 mi (90 km) north of the Colorado State Capitol in Denver. With a 2016 estimated population of 161,000,  it is the fourth most populous city in Colorado after Denver, Colorado Springs, and Aurora. Fort Collins is a midsize college city, home to Colorado State University. Although the city was affected by the Great Depression and simultaneous drought,  it nevertheless experienced slow and steady growth throughout the early part of the twentieth century. During the decade following World War II, the population doubled and an era of economic prosperity occurred. Old buildings were razed to make way for new, modern structures. Along with revitalization came many changes, including the closing of the Great Western sugar factory in 1955, and a new city charter, adopting a council-manager form of government in 1954. Similarly, Colorado State University's enrollment doubled during the 1960s,  making it the city's primary economic force by the end of the century. Located along the Front Range of the Rocky Mountains, Fort Collins experiences a semi-arid climate ( Köppen BSk), with four distinct seasons and low annual precipitation. Summers range from mild to hot, with low humidity and afternoon thunderstorms that frequently threaten but only occasionally deliver rain. Winters range from mild to moderately cold. The city experiences lots of sunshine, with 300 days of sunshine per year and 19 days with 90° + weather. The average temperature in July, the warmest month, is 71 °F (22 °C). The average temperature in January, the coldest month, is 29 °F (−2 °C). Annual snowfall averages 59 inches (1.5 m), and can occur from early September through the end of May. Average precipitation overall is 15.9 inches (400 mm). 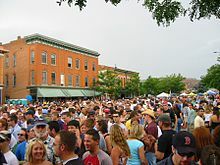 Fort Collins is the fourth most populous city in Colorado and the 158th most populous city in the United States. The Census Bureau estimates that the city's population was 161,175 in 2015, the population of the Fort Collins-Loveland Metropolitan Statistical Area was 310,487 ( 151st most populous MSA), and the population of the Front Range Urban Corridor was 4,495,181. As of the census  of 2000, there were 118,652 people, 45,882 households, and 25,785 families residing in the city. The population density was 2,549.3 people per square mile (984.4/km²). There were 47,755 housing units at an average density of 1,026.0 per square mile (396.2/km²). The racial makeup of the city was 82.4% White, 3.01% Black or African American, 0.60% Native American, 2.48% Asian, 0.12% Pacific Islander, 3.61% from other races, and 2.53% from two or more races. Hispanic or Latino of any race were 10.79% of the population. FortZED is a zero energy district encompassing the Downtown area of Fort Collins and the main campus of Colorado State University. The district's public-private partnerships employ smart grid and renewable energy technologies to manage the local use and supply of energy. FortZED relies upon energy demand management techniques to encourage use of energy at the most efficient times. Fort Collins has a council-manager form of government. The mayor, who serves a two-year term and stands for election in municipal elections held in April of odd-numbered years, presides over a seven-member City Council. The current mayor of Fort Collins is Wade Troxell, who was re-elected to a third term in April 2019. The six remaining council members are elected from districts for staggered four-year terms; odd-numbered districts are up for election in April 2017 and even-numbered districts in April 2019. In addition to PSD schools, several state charter schools serve Fort Collins, including Academy of Arts and Knowledge  and Colorado Early Colleges  and Global Village Academy. Private schools include Heritage Christian Academy, Rivendell School , and St. Joseph's Catholic School. The Institute of Business & Medical Careers provides professional training in the business and medical professions. The institute's first campus was established in the city in 1987. 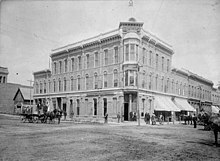 The Fort Collins Public Library was established in 1900, the sixth public library in the state. [ citation needed] The city received $12,500 from philanthropist Andrew Carnegie to build the library, with the condition that it would be maintained as a free public library. It was completed in 1904 at a total cost of approximately $15,000. The library formed a regional library district through a ballot measure in 2006. It has been renamed Poudre River Public Library District. The district operates three branches: the Old Town Library is located in downtown Fort Collins; the Harmony library is hosted at Front Range Community College; and the Council Tree Library, which opened in 2009, is at the Front Range Village Shopping Center. The library participates in cooperative projects with the local school district and Colorado State University. Fort Collins has a range of research institutes. Facilities are maintained by the Centers for Disease Control and Prevention's Division of Vector-Borne Diseases,  the Center for Advanced Technology and the Colorado Water Resource Research Institute. Other facilities include the Cooperative Institute for Research in the Atmosphere, the Institute for Scientific Computing, the U.S. Forest Service Experimental Station, the National Center for Genetic Resources Preservation (NCGRP), and the U.S.D.A. Crops Research Laboratory. Fort Collins's downtown streets form a grid with Interstate 25 running north and south on the east side of the city. Many of the streets are named after the town's founders. U.S. Highway 287 becomes College Avenue inside the city and is the busiest street; It runs north and south, effectively bisecting the city, and serving as the east–west meridian, while Mountain Avenue is the north-south. SH 14 runs concurrent with US 287 at the northern city limit to Jefferson Street, running southeast along Jefferson (later turning into Riverside Avenue), then turning east onto Mulberry Street where it goes east out of the city after an interchange with Interstate 25. Fort Collins also once had a municipally owned trolley service with three branches from the intersection of Mountain and College avenues. The trolley was begun in 1907 by the Denver and Interurban Railroad, who had the intention of connecting the Front Range of Colorado together . It was closed in 1951 after ceasing to be profitable. In 1983–84, a portion of the Mountain Avenue line and one of the original trolley cars, Car 21, were restored as a heritage trolley service, under the same name used by the original system, the Fort Collins Municipal Railway. This has been in operation since the end of 1984 on weekends and holidays in the spring and summer, as a tourist- and cultural/educational attraction small fee applies to ride. The MAX Bus Rapid Transit is a bus rapid transit that provides service on the Mason Corridor Transitway parallel to College Avenue from Downtown Fort Collins to a transit center just south of Harmony Road. The trip takes approximately 15 minutes from end to end with various stops between. The service began in May 2014. The Mason Corridor and the Mason Express are intended to be the center of future transit-oriented development.